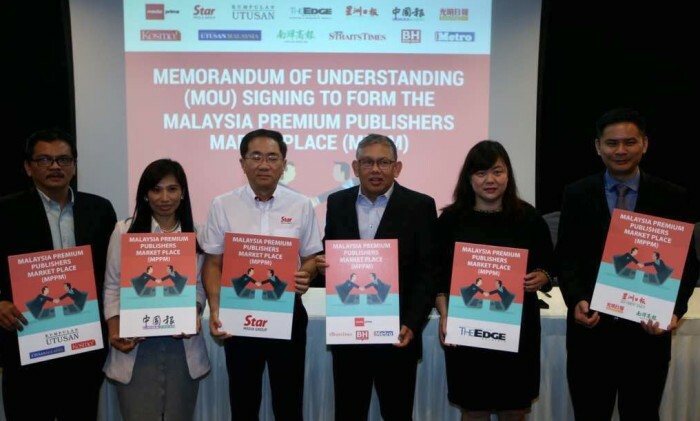 Five leading Malaysia online publishers namely Media Prima Group, Star Media Group, Utusan Malaysia, MCIL and The Edge signed a memorandum of understanding (MOU) to form a consortium called Malaysia Premium Publishers Marketplace (MPPM) to create an advertising exchange. This primarily signifies the combined effort to “combat the severe risk of damaging brands reputation in programmatic online advertising in Malaysia,” according to Media Prima Group’s statement to A+M. “MPPM gathers some of Malaysia’s top media companies to effectively deal with the common digital advertising challenges such as ad fraud and brand misplacement and provide an extensive solution to further expand brands’ reach to the local market,” it added. MPPM will comprise of 11 online premium publishers including New Straits Times, The Star Online, The Edge, Berita Harian, Utusan Malaysia, Harian Metro, Kosmo, Sin Chew Daily, China Press, Nanyang Daily and Guang Ming Daily. MPPM’s spokesperson said there are plans to get more local online publishers to join this project in the future. Publishers are selected based on online reach, as well as quality content. The collaboration hopes to reach a “symbiotic” relationship between the local publishers and the clients. MPPM’s spokesperson said it aims to offer “marketers with high quality online advertising inventory from local premium publisher websites backed by rich audience data and high-impact online ad solutions.” This platform will enable the delivery of brand messages and performance campaigns with ease at scale while offering marketers a safer and transparent online ad buying ecosystem, the statement read. To ensure the transparency and ethical operating standard of MPPM, a third party company will manage these ad inventories in order to simplify and ensure the delivery of quality online ad inventory to advertisers. “Advertising is the main revenue stream for the media companies. With the changing landscape of advertising in Malaysia, it is time for our media companies to find a better solution to simplify and improve the ad buying process, while addressing the market needs in terms of providing transparency, viewability and brand safety”, said Datuk Abdul Jalil Hamid (pictured, fourth from left) , chairman of Malaysian Newspaper Publishers Association (MNPA). “MPPM offers more premium ad inventories which will not be made available on the open exchange. With more talented media personnels working behind MPPM, we aim to provide more creative ad formats that can further reach a wide range of audience in the near future,” he said. The MPPM MOU signing is the first of many steps being initiated to demonstrate local premium online publishers’ commitment in embracing the digital standards that is being set by the Joint Digital Committee (JIC Digital). JIC Digital is an industry committee that makes recommendations to promote greater transparency of online ad trading in Malaysia. Total Homecare's Comfort Ultra Pure has launched a Facebook campaign to capture special motherhood moment in conjunction with Moth..